Mels Box of Chocolates: It wasn't pretty, but I did it! It wasn't pretty, but I did it! I've been in quite the funk as winter just won't bid us goodbye and spring break seems like it's never gonna get here. Motivation to do anything after work is null and void. For about a month, I swear I was coming home from work, eating dinner, and crawling straight into bed. Then one of my coworkers started walking/running and was asking me about my running. She knew that once upon a time I was running and even participating in 5Ks. Little did she know that my sneakers haven't seen my feet in a.very.long.time. After talking with her a few days, she inspired me to get out and start walking/running again. 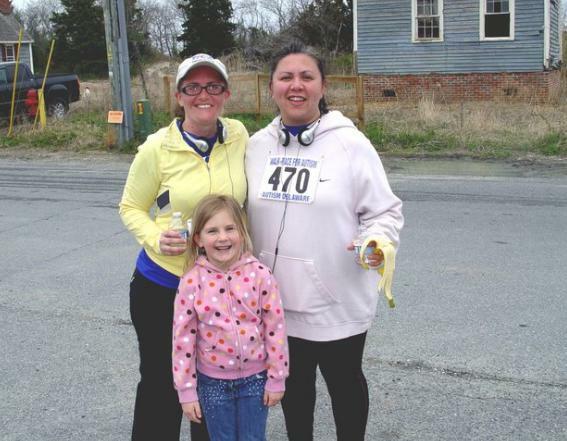 Then we started talking about a local 5K that was coming up to support Delaware Autism. Somewhere along the line I lost my mind I decided it would be motivating to sign up for the race, which happened to be the same 5K that I ran as my first race ever a couple years ago. I set everything out the night before so I would be all set to go and then enjoyed my eggs and toast for breakfast. Then the kids and I hopped in the car to head to the start line. I knew that because of my lack of training I could seriously hurt myself if I pushed too hard so before I started I knew that I would not run the whole thing. Yes, I wanted to push myself. Hurt something? No. I started pretty comfortable riding on the racing adrenaline and actually made it a little over a half mile before I decided to take a walking break. The fabulous thing about this race is that we were in a neighborhood that had tons of streets so I could play my mind games of just running one more street. So I ran some and walked when I needed to. 45:53 later, I crossed the finish line. I was about 7 minutes slower than my fastest 5K, but considering my lack of training I was pretty proud. My friend's hubby snapped this picture of us after the race. Look we are still smiling!! Me, My friend, Vicki, and of course Zoe had to get in the pix too. Now that I ran one, I'm already looking for my next one!! It feels good to be back on the running road.